The Himalayan Stove Project is one of those organizations that mediates a need most westerners don’t even know is an issue. Sure, we hear about world tragedies on the news: poverty, war and natural disasters. These are noteworthy, pressing problems in need of media attention and aid. But it’s rare that a nonprofit has the intelligence to not only address a dire problem (a problem that wouldn’t be on the radar of any #firstworldproblem twitterer), but also to offer a perfect, tried-and-true solution. According to the World Health Organization (WHO), nearly 3 billion people cook meals on stoves using biomass materials, such as wood or animal dung. The majority of this cooking takes place indoors, especially in high-altitude, frigid regions such as, you guessed it, the Himalayas. Byproducts of cooking stoves are dangerous when inhaled. Indeed, indoor air pollution is the fourth-most deadly ailment in the world behind malaria, unclean water and HIV/AIDs. And because they spend more time cooking inside their hut, yurt, tent or shack, women and kids are impacted the most. Some sources even estimate that indoor air pollution causes 900,000 child deaths per year due to respiratory illnesses such as pneumonia. That’s something you don’t have to worry about when firing up a Viking range. While it’s a complex problem, the solution is quite simple, at least in theory: distribute a cooking stove that burns cleanly and efficiently. You eliminate indoor smog. You save fuel. You cook food faster. Bada bing, bada boom. 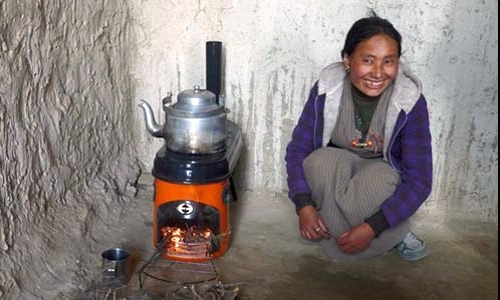 George Basch, founder (and self-described “Chief Cook”) of the Himalayan Stove Project oversees the organization, which distributes the high-tech-sounding Envirofit G-3300 Cookstoves to people living in mountainous Himalayan regions. Remarkably, the stoves reduce harmful smoke and gases by 80 percent, slash cooking time by up to 50 percent, and conserve fuel (a few hefty sticks of wood) by 60 percent. These outstanding statistics render the cookstove life-changing to families previously cooking with traditional campfires and stoves. During the second stage of delivery, stoves are either gathered from the road head by the villagers themselves or carried on the backs of porters (each stove weighs as little as 6 pounds, but they are somewhat bulky to carry). Yaks, however, are out of the question. “They are rather rambunctious beasts,” says Basch. “They have a tendency to bang their loads around, trying to show that they’re the boss (they usually are – big and a trifle mean) so to date we’ve stayed away from using them – we want to deliver the stoves undamaged.” Noted: No yaks. After having seen the profound impact his stoves can have on a person’s quality (and longevity) of life, Basch has big plans for the future. And you can help. This season, the Himalayan Stove Project is offering a Mount Everest Commemorative Poster to celebrate the 50th anniversary of the first five American mountaineers to reach Everest’s summit in May 1963, shown below. 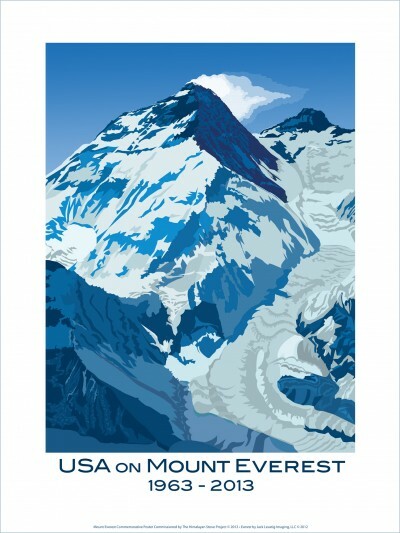 Designed by artist Elizabeth Mercuri, the poster’s Art Deco-style depiction of Everest would make one awesome gift for the crunchy granola outdoor enthusiast in your life. I particularly like how the snowy ravine, I believe it’s the Khumbu Icefall, up to the summit is reminiscent of a dragon (anyone agree?). This puppy can be yours for a donation of $250, all profits go directly into the Himalayan Stove Project. To support the region that has rendered travelers speechless for centuries, order your poster here.